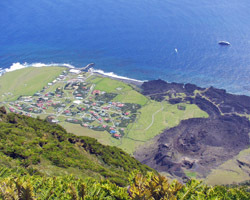 Reports of visits by cruise ships to Tristan da Cunha during the 2009/2010 season. The Professor was photographed right on 10th April by David Morley. The Molchanov was due to arrive here on Friday 9th April. 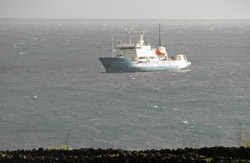 Unfortunately weather predictions did not look good so she slowly cruised up from Gough and arrived here late afternoon. Indeed weather was miserable Friday and Saturday and we all waited in deep anticipation that Sunday would bring a better day. Sunday morning arrived and although weather had calmed and the harbour was like a lake, there was still a strong wind blowing causing quite a heavy swell beside the ship. The Captain and Expedition leader decided it was not suitable to land passengers so we decided to see if we could get our passenger Sue Scott, Immigration and Posts and Handicrafts aboard. 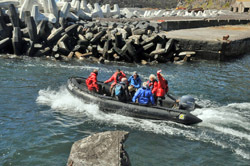 The Search and Rescue Rib was taken to the harbour and all parties were taken aboard. A pilot ladder had to be used as weather was not suitable for the gangway. The party stayed aboard for half a day and passengers were so pleased to be able to buy a souvenir from Tristan, the most popular item being the knitted penguins. The party left the ship at 1.30 pm bringing lots of postcards to be posted and the Professor Molchanov departed to do a cruise of the outer islands before leaving for St Helena. coast of Brazil. All on Tristan were saddened by this news but were glad there was no loss of life. Our sincerest wishes go out to the ship's company. We hope next year will bring more cruise ships, calmer seas and sunny skies. so island guides boarded the ship which went on to Nightingale Island. Education Adviser Jim Kerr gave an illustrated talk aboard the ship during the voyage to the outer islands. The ship has a compliment of 75 European officers and crew, is 297 feet long, has an ice-strengthened hull and a fleet of zodiacs to land passengers. feasted on lobster sandwiches and bottled Tristan water. on a trip to the 1961 Volcanic cone and lava flow. the embarking process as the ship wanted leave by 1pm. Thanks to Dawn Repetto for the report and to David Morley, Sue Scott and Carel van der Merwe for the images of the visit. 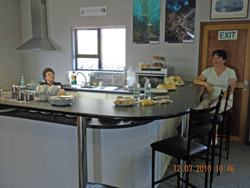 Jean Swain (right) and Rosemary Glass waiting for customers in the new coffee shop selling bottled Tristan water, lobster sandwiches, quiche, home made fudge, flapjacks and crisps. The Coffee Shop corner of the new centre. 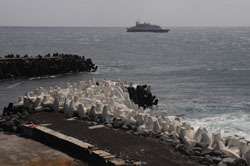 The loss of SV Concordia to freak weather conditions off Brazil on 17th February 2010 shocked Islanders who were looking forward to the ship's visit. So the island only now expects two cruise ships to call during the 2009-10 season and hopes for good weather so that passengers can come ashore and enjoy Tristan's famous hospitality. 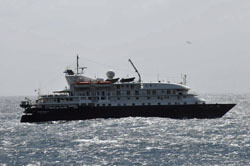 See report of the loss of SV Concordia on our Shipping News Page.